How We Drive, the Blog of Tom Vanderbilt’s Traffic » Blog Archive » How’s My Traffic Control? 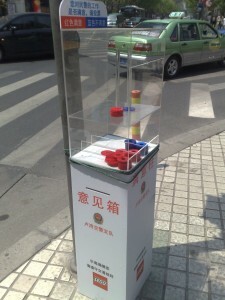 I love the simplicity of this Lego “Satisfaction Post” (满意柱) which apparently has been placed at an intersection in Shanghai to give passerby (pedestrians, presumably) a chance to offer feedback on how they think traffic is being controlled at that location. This entry was posted on Wednesday, April 29th, 2009 at 8:31 am	and is filed under Etc., Traffic Culture. You can follow any responses to this entry through the RSS 2.0 feed. Both comments and pings are currently closed.